"Food, a French man told me once, is the first wealth. Grow it right, & you feel insanely rich, no matter what you own." We sure are feeling the bounty of the growing season here at the farm. We picked beans for the first time on Friday, & we harvested over 50 pounds! You can expect a 1.5 pound bag of beans in your share this week. The rest of the summer crops are thriving. The sweet corn's silks & tassels are out, which is an exciting site to see. We'll be digging the first carrots & new potatoes this week & are (im)patiently awaiting our first ripe tomatoes. 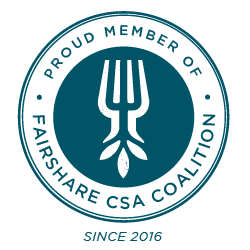 Our next CSA member potluck is next Tuesday, the 19th, at 6pm. If you are coming to the potluck, let us know if you'd like to pick up your CSA share here at the farm. We will plan to have our flower & herb patch open for u-pick, & we will let you all know if there will be anything else (green beans??). Due to scheduling conflicts, our Farm Party is being rescheduled from the end of August to October 15th at 4pm. Please, update your calendars! In other news - we're expecting! We're due in January & look forward to welcoming our little one whenever he/she arrives. Have a beautiful week! IT'S SUMMER!